The cadherin glycoproteins includes over 100 members divided into 6 subfamilies; type I classical cadherins , type II atypical cadherins, desmosomal cadherins, flamingo cadherins, proto-cadherins and several ungrouped members. Cadherins can be identified through common motifs in their extracellular domains termed cadherin repeats. Not all cadherins are involved in cell-cell adhesion, though type I and type II cadherins have well established roles in this process . Both of these subfamilies contain cadherin repeats within their extracellular domains, with the outermost cadherin repeats facilitating extracellular interactions with cadherins on apposing cells (transinteractions). Type I cadherins can in addition engage in lateral interactions on the same cell (cis interactions). Intercellular interactions between cadherins can occur between those of the same type (homophilic binding) or a different type (heterophilic binding). Intracellular interactions involve the cytoplasmic domains of the cadherins. In the case of type I cadherins these interactions can be used to identify this subfamily, namely through their ability to bind catenins via their cytoplasmic tails. Catenins form part of the bridge connecting adherens junctions to the actin cytoskeleton. It should be noted that individual cadherin interactions are weak. The strength of cadherin-based adhesive junctions comes from the clustering of multiple, weak cadherin-cadherin interactions . This schematic diagram illustrates the molecular organization of cadherin. The cadherin protein family are common cell-adhesion molecules (CAMs) that mediate cell-cell contacts at anchoring junctions (e.g. 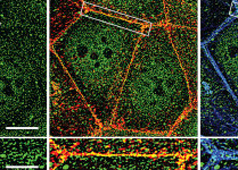 adherens junctions, desmosomes) and at prominent sites of cell-cell communication (e.g. neuronal synapses). There are over 100 different cadherin family members that are grouped into at least 6 subfamilies, including type I classical cadherins, type II atypical cadherins and desmosomal cadherins . All cadherins share a common architecture in their extracellular domain that comprises cadherin repeats, with classical cadherins containing five of these repeats. Subtle differences between cadherins impart each type with specificity for particular tissue and cell types. 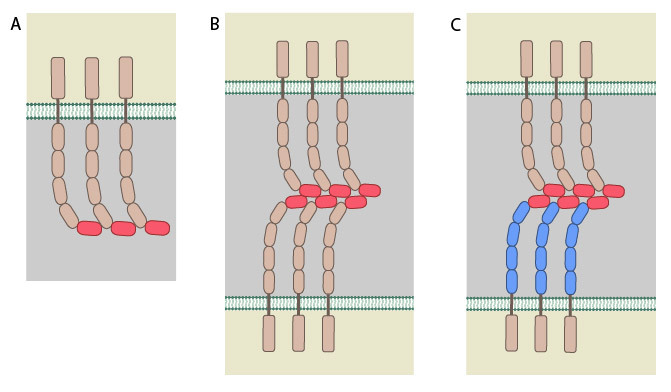 Cadherins use a common set of adaptor molecules and pathways to facilitate cell adhesion and communication, however the strength of adhesion varies with the type of cadherin present . Most cadherins adhere by homophilic interactions (i.e. they bind to the same type of cadherin) but certain types (e.g. E-cadherin) also adhere by heterophilic interactions (i.e. they bind other types of cadherin). Cadherin association is sensitive to extracellular calcium (hence their name, calcium adhering). The interactions can take place laterally on the same cell, called a cis interaction, or between two cells, called a trans interaction. All cadherins have a common extracellular domain that is structured into tandem blocks that are variable in number and are called ‘cadherin repeats’; classical cadherins have five cadherin repeats (as shown). The cadherin intracellular domain is bound by adaptor proteins. (A) Example of a cis interaction (i.e. on the same cell) that is homophilic (i.e. cadherins of the same type). (B) Example of a trans interaction (i.e. between two cells) that is homophilic. (C) Example of a trans interaction that is heterophilic (between two different types of cadherin). Structurally, classical cadherins have five Ca+2-dependent extracellular domains and a relatively short cytoplasmic domain. Although cadherin-cadherin binding between the extracellular domains is relatively weak, the conformational changes that are induced after binding imparts the individual cadherins with rigidity. This stabilizes the interaction and fosters additional lateral cis interactions with other cadherins and generates tighter adhesions. Increased clustering of cadherins at sites of cell-cell contact correlates with increased stability and maturation of actin-based structures such as dendritic spines . The classical cadherins (e.g. E-, N-, and P-cadherins) are the most common family members. Classical cadherins interact directly with p120ctn at their transmembrane region and through their cytoplasmic tails to beta (β)-catenin or plakoglobin(i.e. gamma [γ]-catenin). The correct function and stability of the cadherins requires these associations (reviewed in ). β-catenin binds tightly to classical cadherins before they are transported to the cell surface ). Cadherins further interact indirectly with other adaptor proteins (e.g. alpha [α]-catenin, vinculin, EPLIN,α-actinin, zyxin) to form linkages between the cell membrane and the actin cytoskeleton (reviewed in ). Desmosomes in contrast, have two specialized cadherins that interact with specific adaptor proteins (e.g. plakoglobin, plakophilin, desmoplakin) to form links with the intermediate filaments. In addition to the well-established role of classical cadherins in mediating intercellular adhesions, recent research has also revealed the existence of distinct cadherin clusters outside of these adhesions. The physiological significance of such non-junctional cadherin clusters was elucidated in a recent study that analyzed the organization and functions of HMR-1, the C.elegans homolog of cadherins, within its single-celled zygote that is devoid of any intercellular junctions. The study demonstrated the organization of HMR-1 into clusters and the ability of these clusters to associate with cortical actin during the retrograde flow of the cortex. Surprisingly, HMR-1 clusters were shown to negatively regulate myosin-mediated contractility of the actin cortex and, as a result, impede its retrograde flow by inhibiting Rho-I GTPase functions and the subsequent accumulation of non-muscle myosin II (NMY-2) at the cortex. 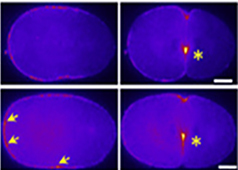 An increase in the levels of HMR-1 was also associated with a decline in the initiation and ingression rate of the cytokinetic furrow during the first division of the zygote .The findings from the study confirm the existence of adhesion-independent roles for HMR-1 clusters in reinforcing the stability of the actomyosin cortex and regulating cell-shape dynamics during the very early phase of embryo development . In response to physical/chemical properties of the matrix and growth factors in the environment (outside-in signaling), integrins bind ligands and get activated. Accordingly, a variety of signaling pathways can be triggered mainly through the different kinases as mentioned above. These can bring about changes in one or more cellular events (short term responses) that eventually result in global (long term) responses in cellular behavior. Adapted from . Integrins undergo a process called activation, during which conformational changes expose the headpiece (βI and hybrid domain) for ligand binding . This can be initiated by the binding of adaptor proteins and/or ligands. Adaptor proteins bind to the integrin cytoplasmic domains, thereby connecting integrin to the cytoskeleton. Integrins microcluster laterally for efficient ligand binding. Upon activation, integrins are capable of triggering a variety of signal transduction cascades. The combination of α and β subtypes, for example, will affect different in vivo functions. As demonstrated by knockout mouse studies, and highlighted in the table below, these include cell behaviour and tissue organization (reviewed in ). 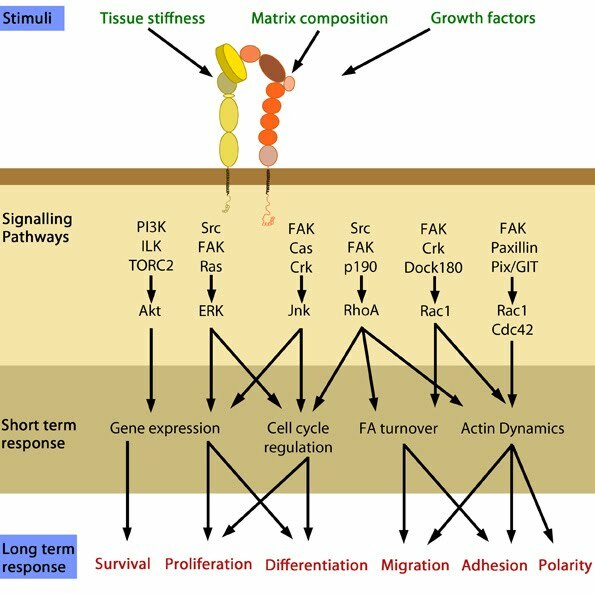 Which signalling pathway is initiated by integrin activation is based on the biological context, as well as the ligands bound (matrix components/growth factors). Depending on the combination of these factors, a variety of short-term and long-term responses may result . Substrate stiffness has also been shown to affect the type of adhesion structure formed following integrin activation. One study revealed the development of podosome-like adhesion structures in non-transformed fibroblasts grown on fluid, membrane based substrates. In this case, integrin was activated by membrane bound RGD (Arg-Gly-Asp) peptides. When grown on rigid surfaces, RGD-activated integrin would normally initiate the formation of focal adhesions . The adhesion structures formed on the softer substrates had a similar morphology and makeup to classic podosomes found in macrophages. However, despite also being protrusive, the physiological function of these podosome-like structures remained unknown. The formation of these podosome-like structures in the absence of forces was mediated by p85beta recruitment and local PIP3 enrichment at the adhesion sites; both of which are not observed in focal adhesion formation. 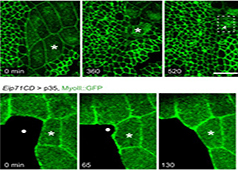 The increased production of PIP3 then caused N-WASP activation and RhoA -GAP ARAP3 recruitment, which downregulates RhoA-GTP level in podosome-forming cells. How are adherens junctions assembled? How is cadherin recruited to the adherens junction? What is the role of cadherin and nectin recruitment in adherens junction assembly? How does actomyosin facilitate contractility in muscle and non-muscle cells?